Bedding bass can be a controversial subject among fishing enthusiasts. Some anglers target bedding bass during April on Lake Martin. Some don’t. 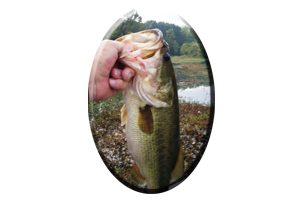 Ask any angler that has attempted to catch a bass that is actually on the bed and most will tell you it is not an easy task. You may spend as much as one hour trying to irritate the smaller male bass into striking your lure. If your lucky enough, you may get a shot at a much bigger female bass that actually only spends a few days on the bed. Some bass may hit your lures instinctively. Traditionally, most strikes from bedding bass do take time to take place. Anglers that are competing in one of Lake Martin’s weekly spring time bass tournaments, may find it worth their effort to spend some time on just one particular bedding bass. If a bass tournament angler is fortunate enough to fool a bedding bass into striking and then get it in the boat, it could prove to be the winning bass and reap the angler hundreds of dollars for big bass of the tournament. The downside of this bass tournament game plan is the angler in the back of the boat cannot fish for this same bedding bass. 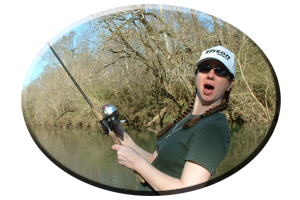 He or she could be the successful anglers partner and be ready with the net. Or the angler in the back of the boat may be a competitor. So the back of the boat angler should just fan cast the immediate area around the boat, with as little disturbance as possible to entice other bass either bedding or cruising in the same shallows to bite. Stealth, making long casts, being very quite with a very slow approach and fishing without making any sudden movement in the boat…is the ticket to sneaking up on bedding bass. Many bass tournament organizations pair up professional anglers in a draw format with an amateur angler. The pro gets first shot at any bedding bass that is spotted. The amateur angler either fishes open water, or sits perfectly still. This allows the angler in the front of the boat ample time to successfully fool the bedding bass into striking. Exciting, but not a lot of fun, especially when it may take more than an one hour to get the bedding bass to bite. 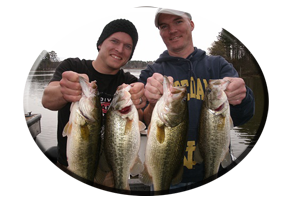 Most anglers just fish Lake Martin for the fun of it often keeping a few bass for the dinner table. 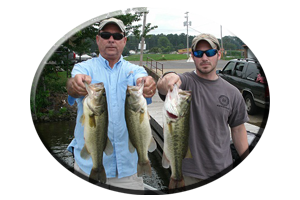 In recent years on all of Alabama’s Lakes the concept of catch and release has really influenced most anglers to return these bass back to the lake. This assures some future angler a thrill and most importantly it allows the bass its freedom to live, breed and fight another day. Letting these bass go right where you caught them, leaves both the male and female bass with a chance to get back to their duties. Which is protecting the bed from egg eating intruders. This ordeal could last for weeks. Or after the eggs hatch, the very protective mother and father of these newborn bass can guard over the newborn bass fry for weeks. That is, until they can make it in on their own in their new, underwater world. 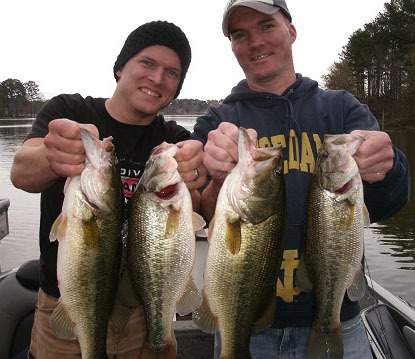 If Lake Martin anglers want to keep a few bass to eat, there is nothing wrong with that. To avoid catching male or female bass that are actually bedding in spawning flats displaying less than three of water, just fish out away from these spawning areas in slightly deeper water. 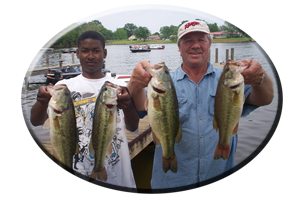 This is where you can catch the smaller spotted bass, a much more tastier fish than a big, old largemouth bass. Fishing away from the spawning flats does have its rewards as well. Not all bass spawn at the same time. An angler pounding the shallows is always fishing used water behind other bank beating anglers during the spring season when our lakes once again get crowded. Anglers that target bass away from the bank may discover hordes of bass waiting to move up and spawn. You may have these places all to yourself and discover bass that other anglers are overlooking. Please practice Catch an Release this spring when targeting these bedding bass. The future of fishing depends on you.